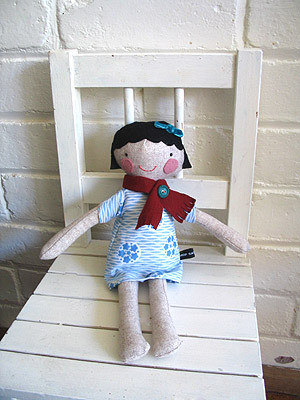 I seem to have regained a little of my crafting mojo this week, and finished off this little doll, Alice, for an order today. 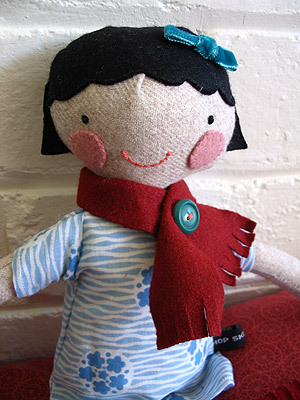 Her dress is cut from one of my favourite prints - a piece of vintage cotton fabric found at a church fete last year. I rarely seem to unearth such goodies, so this was a golden find indeed. Wow. I never expected such a reaction to my last post, but I am so grateful for every single comment. Thankyou so much for each suportive word and for sharing your stories, too. I'm trying to respond to as many as I can, but am not sure if that's a practical plan. Please know that every response has been read and treasured. I've decided to write to the authors of some popular pregnancy books to suggest that they provide a little more information about miscarriage just so it's, you know, on hand if it's needed. As Jo wisely commented, very few freshly pregnant women are going to pick up a book on miscarriage as a matter of course (I know I wouldn't! ), but if some of the information we need is there in books we have on our shelves already, that's a huge start. If anyone has any books/authors to suggest, please email me or leave a note in the comments section. Thanks again - so much. So, my WIP this week is to try to regain a normal sense of rhythm around the house. I think we're getting there slowly! 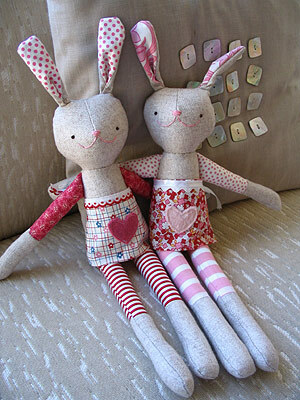 In the name of craft as therapy I finished two little bunnies that had been on my desk for a few weeks. One step at a time, yes? Thanks again for your support, lovely internet. Have a great weekend. 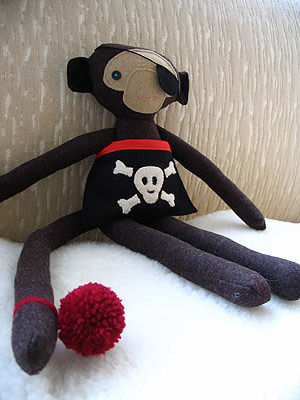 Thankyou so much for all your sweet comments about the pirate monkey. They have been so warmly welcome over the past couple of weeks which have, frankly, been fairly crap around these parts. I don't usually post too much about personal stuff up here, but I've been so absent from this space recently, and if you’ll allow, I'd like to explain why to my dear blogging friends. Just over two weeks ago I had a miscarriage. I was 8 week pregnant and so, so happy to be so (albeit with around-the-clock nausea and feeling completely exhausted - but in a good way, you know?) In retrospect I was more nervous about complications this time around compared to when I was pregnant with Audrey. I wonder if deep down I knew that all was not well, but at the time I just put it down to the stakes feeling so much higher this time. As two of my favourite bloggers have so eloquently written before me, already having a child meant that this time I knew what we had to lose. It seems there are as many ways to miscarry as there are ways to birth a baby, yet I didn’t know this until after I’d been through it myself. For an incredibly emotional and heart breaking experience, the emphasis (at least publicly) seems to pivot on tests, cold medical details, statistics, and waiting around to see what is going to happen next. My miscarriage was (as they say in the business) "incomplete". So I waded through a whole week of contraction-like pain and enough ultrasounds to last me the rest of my life, before the physical bits were over. It was the week leading up to the Morphe opening, and I had so much planned, including more toys, but that just didn’t happen unfortunately. One thing that this experience has taught me is how little information is available to women in the throes of complications with their pregnancies. Despite good medical care (my Obstetrician was away - can you believe it? Thankfully her stand-in was experienced and compassionate), no one could really tell me what I could reasonably expect - how long the process was likely to take, for example. I'm so, so glad Matt was by my side the whole time because really, it was one of the most lonely experiences I have ever had. I desperately wanted to normalize the experience, but I had a really hard time finding the information I needed. I was lucky enough to have the support of a dear friend who, sadly, knew from her own experience exactly the perfect things to do and say. Thank goodness for our female friends, hey? The historian in me can’t help but notice how still, in this era of the internet and multinational publishing, some of the most useful information is still passed the old fashioned way from woman to woman. In any case, the whole time I just kept thinking about the tomes of information available to pregnant women who carry a baby to full term – and wondering why my books about pregnancy only carried a few scant paragraphs about miscarriage (basically amounting to: “it’s common, it’s sad, try again after x months.”) According to one of the many (usually conflicting) statistics I’ve read over the past fortnight, miscarriage happens to 1 in 4 confirmed pregnancies. So why is it that helpful details are so thin on the ground? Is there anything we can do about this? I’m still trying to work that out. Anyhow, I’m sorry to use this usually chirpy space to have my rant about this, but it is what is going on for me right now. Thanks for reading this far if you’re still with me. I really wanted to write about it here because miscarriage is so common. And not talked about nearly enough. It’s sad, but we should talk about it – because more talking means more information, and perhaps eventually less of a veil of secrecy over something that so many women go through. 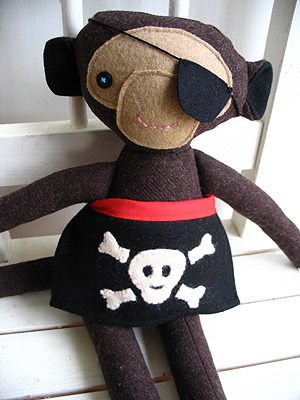 Pirate monkey for Morphe II. Yo ho ho, and a (banana flavoured) bottle of rum.